Scientists have suspected for a long time that Native Americans are closely related to the peoples of Altai. The theory of the Altai peoples migrating from Siberia across Chukotka and Alaska, down to the Tierra del Fuego at the tip of South America, appeared almost a century ago. Since then researchers have tried to prove this, and in late 2015 the famous Russian geneticist, Oleg Balanovsky, finally confirmed the theory. In addition, Dr. Balanovsky’sstudies also proved that some Native Americans have kinship with the indigenous populations of Australia. In 2013, two of the world’s leading scientific magazines, Nature, and Science, published articles about the analysis of whole genomes in Native Americans and their Siberian cousins. A comparison was made with populations in other regions throughout the world. The first study analyzed 48 people from Brazil. The second study analyzed 31 genomes from peoples in the U.S. and Siberia. Results from both studies confirmed that the ancestors of Native Americans left Siberia about 20,000-30,000 years ago. After these publications Dr. Balanovsky decided to conduct a larger study, and so he notified international colleagues. They immediately responded to his request. In the first stage, scientists analyzed DNA samples from the Russian biobank. “Our biobank contains more than 25,000 samples from representatives of 90 nationalities in Russia and neighboring countries,” Dr. Balanovsky told RBTH. In the second stage, the DNA was analyzed according to various markers such as the Y chromosome that is inherited from the male line, as well as the mitochondrial DNA that is inherited from the female line, and other chromosomes that are combined from both parents. As a result, scientists proved beyond a doubt that Native Americans are closely related to the peoples of Altai. But during the study another discovery was made. 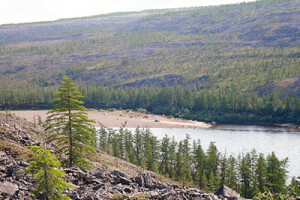 Scientists already know how humans traveled to the Americas from Altai. “Instead of the Bering Strait there was a land bridge [30,000 years ago], because during the Ice Age much water was locked in glaciers and the level of the world’s oceans was lower,” Dr. Balanovsky explained. He added that it’s still not clear whether migration from Australia and Melanesia to the Americas was directly across the ocean, or by going up along the coast and via the Aleutian Islands. Archaeologists continue to study this issue.